The field research in the Artemision of Ephesus, which the Austrian Archaeological Institute resumed again in 1965 after a decade-long interruption, brought a massive amount of findings in addition to epochal results in the topography, architecture and history of this holy site. The wide spectrum of different, often very valuable, materials shows that the site was already a cult site of multi-regional significance in the seventh century B.C.E. After over thirty years of excavations it was clear that the presentation of this quantity of findings could not be processed contextually in a comprehensive manner. After careful thought, it was decided to order the findings according to material. 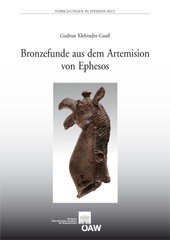 This volume presents the objects made of bronze. They not only form one of the largest groups, they are also one of the most important complexes of its kind from the Late Geometric and Early Archaic periods. Their examination broadens the understanding of the metal arts in eastern Greece, and helps to determine the eastern Aegean region's role as a mediator for technology and styles. In addition to this, bronzes, in their function as offerings, are an important testimony to the cult activities at this holy site: for the early period of the Artemision, an era without any written remnants, votive objects are the main source for determining cult practices. Published with funding from the Austrian Science Fund.